Bears! 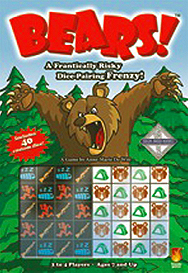 is a fast-playing, competitive game in which players score points by pairing dice at the same time. Shoot bears and run from tents for a few points, or take a risk and score big by sleeping through the attack. But watch out! If bears are left at the end of the round, your sleeping campers are done for.